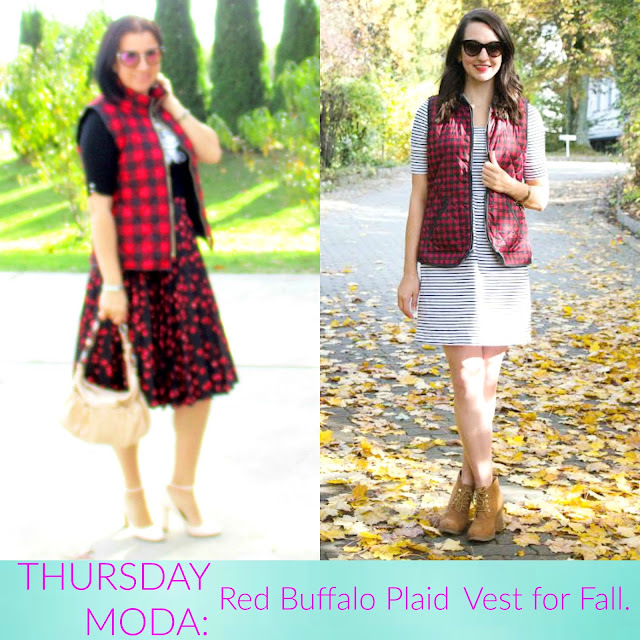 Thursday Moda #36: Red Buffalo Plaid Vest for Fall. Hey you all. Welcome to the first Thursday of November, a blissful, thankful month! Before we get to today's pretty outfit, let's touch a little bit on the elephant in the room. The elephant would be me (lol) and I am referring to my new chopped hair, which is now a short, sassy bob. I cut off 11 to 12 inches or so and believe it or not the back is an inch to two inches shorter even. This occurred last week, right on time before the beautiful reception/wedding I attended last Saturday. From what all of you have said on Facebook and Instagram, what all my co-workers, friends and all of the family (which I got to see last Saturday) have said, this haircut is a hit with everyone and to tell you the truth I am loving it though I need to learn how to perfectly style it. It has a lot of volume. What do you think? Oh and today I am co-hosting with the lovely KRISTIN from Countdown to Friday an American blogger currently blogging from beautiful Germany. I love the name of Kristin's blog, first of all. 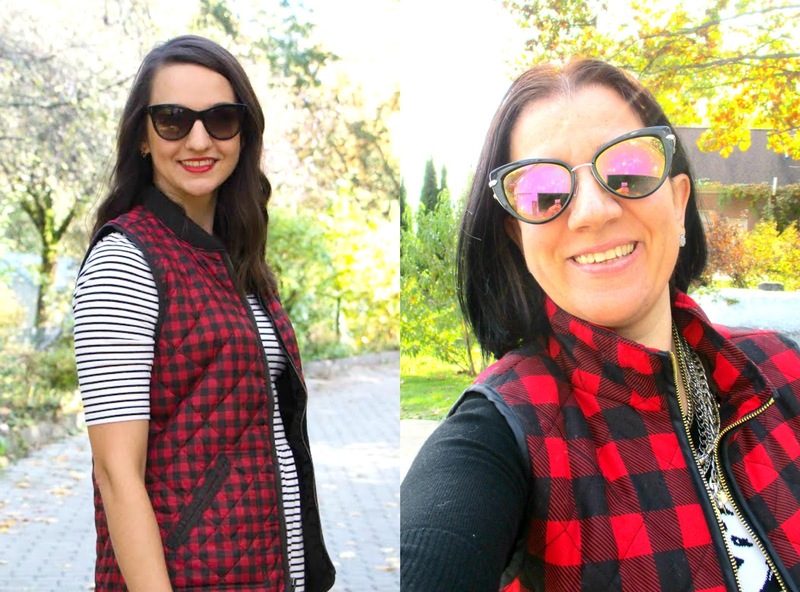 Kristin and I are styling very similar Red Buffalo Plaid Vests and with Thanksgiving coming up, we decided to go a little dressy. Both of our outfits are perfect to wear to a Thanksgiving dinner you are invited to. They make great outfits for the month of December with all the holidays coming up, too. 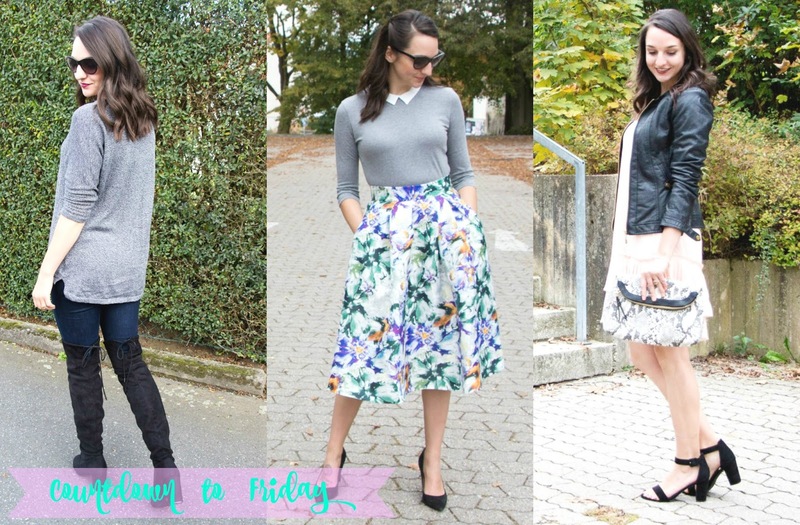 This lovely, stylish girl has only been blogging for 6 months but I love her style and her blog so much, I read every single post from the beginning. I think that is the ultimate compliment you can give to a blogger when you start following them and I have only followed Kristin less than 2 months ago. It is my pleasure to have her grace my blog, today. Like me, she also loves and shops at Old Navy, Banana Republic and Target - three of my most favorite stores. She has a great wardrobe, a killer smile, gorgeous hair in the perfect length and style and I love her photo-shoots too, all over Europe. 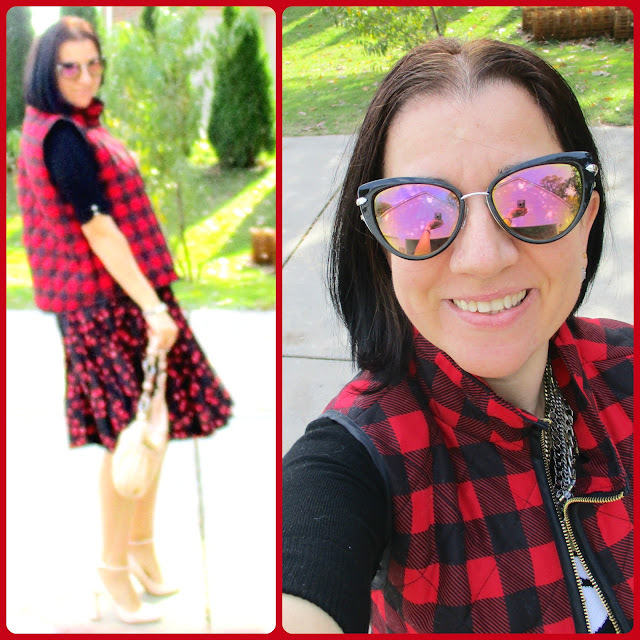 I decided to pair my Red Buffalo Plaid Vest with my Red Cherry Pleated Midi Skirt. 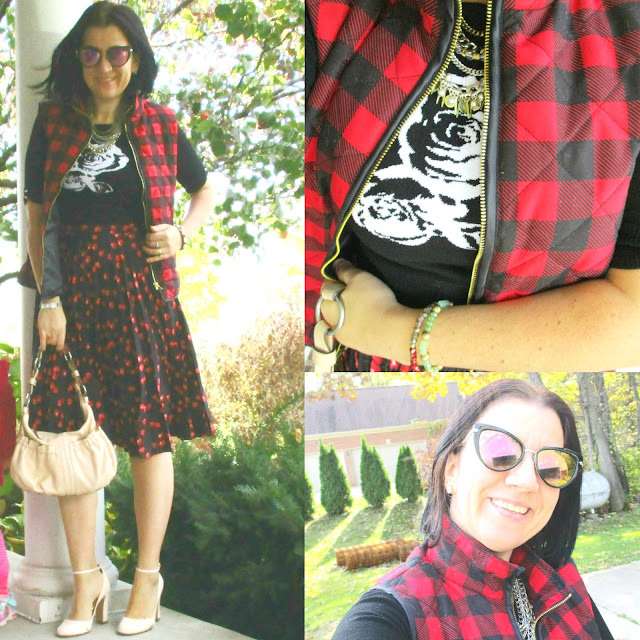 I put on a Black, Elbow-Sleeve, White Rose Intarsia Sweater underneath and an Edgy, Mixed Metal Chain Necklace from my latest Rocksbox. The heavy necklace called for simple earrings so these Fun-Shaped, Charcoal Druzy Kendra Scott Studs (also from Rocksbox) paired so well with the necklace. My new Patent Leather Mary Jane Pumps from Banana Republic are Ivory but with a blush undertone to them, so they matched my Soft Leather Dusty Pink/Blush Purse very well. The Red Cherry Skirt is new from J.Crew and purchased the same day as the pumps, last week. I had a fun shopping trip and picked up some great pieces from both J.Crew and Banana. Lucky for me, J.Crew marked down the skirt at the moment I arrived at the store. I got it for less than 50% off the $98 price tag. As soon as I got it, I knew I would style it with this vest. The Black+Red Prints are charming together and though there are 3 patterns on the outfit, it is still quite monochromatic. And yeah bare legs and elbow sleeves because it was quite warm, though on the shade and for the wind my puffer vest was perfect. I am having a huge lust after cherry prints recently. I may have purchased a couple more. Come back here next Thursday to see some more. I wore this outfit the day after my haircut. I wanted to debut my new hair at work with a stylish outfit and some new clothes. So, did I do my haircut justice with this look? Vivian wanted to hug and kiss mommy the entire time I shot these photos. She told me I was beautiful at least half a dozen times. She even made me late for work. She kept saying: "mommy, cherries and roses, Vivi - bows". As far as the bow, she is referring to her new Gold Bow, Pink Graphic Tee. It must be warm in Germany this Fall too, because Kristin is also in short sleeves and no tights. I love how our black-frame sunglasses are in a similar shape. Gray, Faux Leather Wrap Bracelet w/ 3 Square Crystal Stones in the middle: The Limited (New) (similar, multi-stranded option, love this), (similar two-stranded option, Splurge, my Favorite). Mixed Metal Silver+Gold "Talitha" Collar Necklace with Chain+Spikes: "Talitha" by Jenny Bird via Rocksbox (New) (identical), (similar, Steal, love this), (similar, Great Deal). Sterling Silver Twist-Shaped Ring w/ Light Pink Crystal in the middle: Kohl's (similar, Huge Steal, love this), (similar w/ pink heart, Great Deal), (similar w/ dolphin, My Favorite). Get your own monthly rental from Rocksbox and you can use my own special code- ADABFF39 - to get a free month of Rocksbox jewelry delivered to your home. Black, Elbow-Sleeve Intarsia Sweater w/ White Rose: White House Black Market (similar, on Sale, love this), (similar, Splurge, my Favorite). Red+Black Buffalo Plaid Puffer Vest: Pumps & Pushups Collection (very similar, Steal), (similar flyaway style w/ sherpa inside, Fantastic Deal, love this), (similar, sherpa-lined, Great Deal, my Favorite). 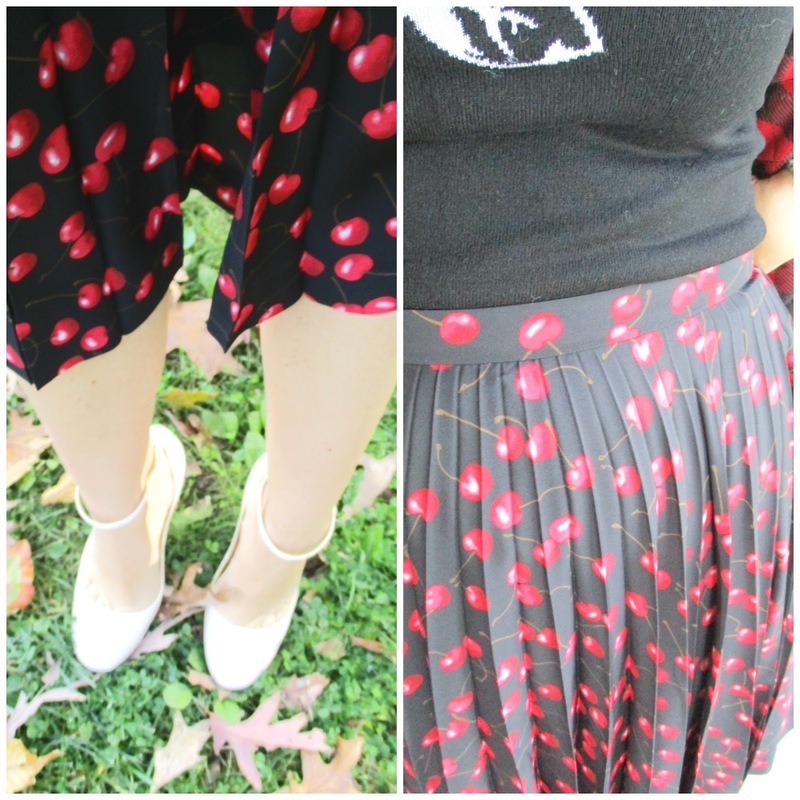 Black Pleated Silky "Olympia" Midi Skirt w/ Red Cherry Print: J.Crew (New) (identical), (gorgeous similar option in white, love this). Dusty Pink/Light Blush Soft Leather Purse: Urban Expressions (similar satchel, on Sale, my Favorite), (similar, Huge Steal), (similar elegant option, Small Splurge, love this). Ivory Patent Leather, Mary Jane Pumps w/ Block Heels: Banana Republic (New) (similar in ivory+black, Great Deal, My Favorite), (similar in black+white, on Sale, love these), (similar, Huge Splurge). 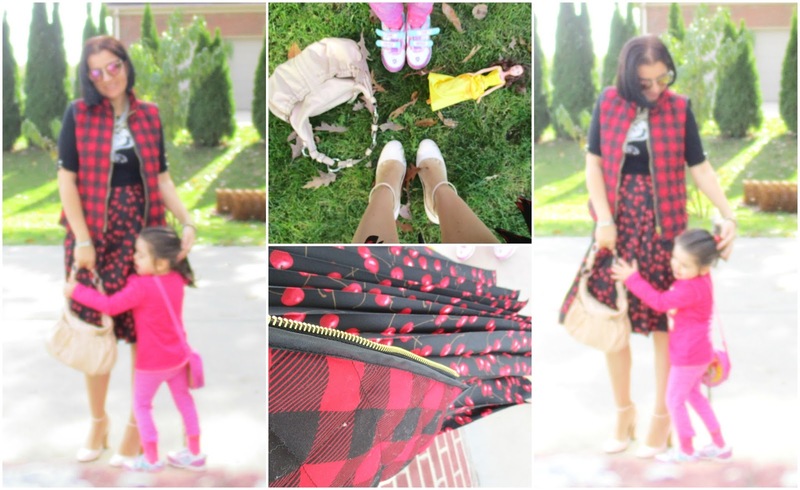 During last week's linkup I noticed a lot of Fall trends and layers as all 117 of you linked up. 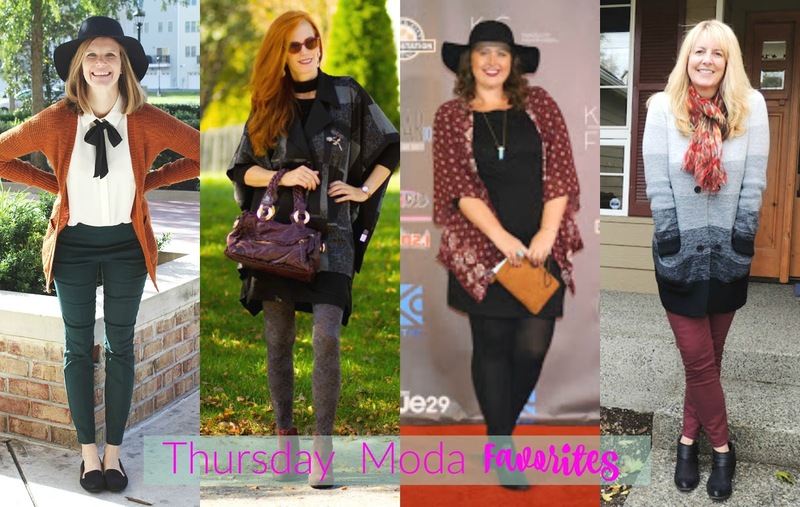 This week when I chose my favorites, I was very much attracted to ensembles featuring hats (I love big hats for Fall) and my two favorite colors for this Fall: Wine and Potter's Clay (Rust). You will see beautiful, understated gray too and I am enamored by those gray gradient long tunic sweaters the ladies below styled. A couple of these outfits were worn by ladies who attended Fashion shows in their respective cities. The name of the game was: Fall Colors and Layers. 'The Tie Neck Blouse' is elegant and gamine on pretty Erica. She exudes Parisian prep. Jess shows her 'Chic Style for Fall' in a collaboration with a New York designer. That coatigan with the oversized lapel is beyond gorgeous. Alex wore several lovely outfits for 'Kansas City Fashion Week', none more Autumnal than this one. I want her kimono. Lana explains her love for 'Scarves' in this post. She mixed this fall-hued scarf with that "50 shades of gray" long cardi whom I love. This week's Featured blogger is TERRI from Meadow Tree with her Dark, Very Elegant, Black+Gray Monochromatic Look. That sheath is very chic but it was the accessories that sealed the deal for me. 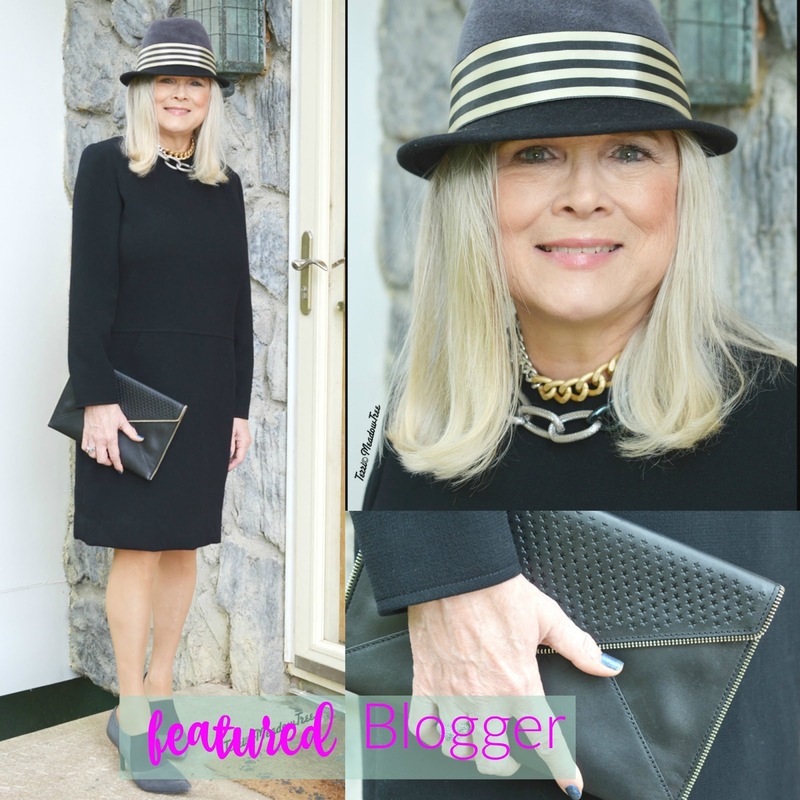 The zippered mini clutch, bootie pumps, dark nail polish, chunky chain collar necklace and ribbon-stripe fedora are all very pretty. I have only discovered Terri's blog for a short while but this lady is always a class act. She looks great in a pair of trousers. 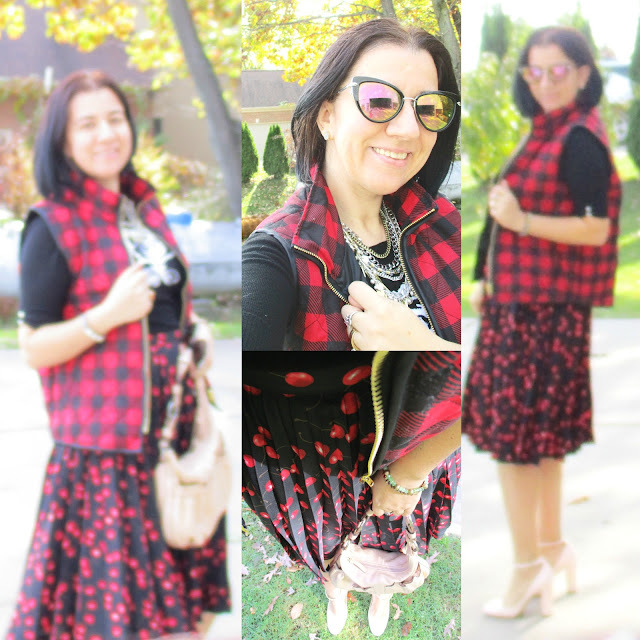 You must follow her, especially if you need style inspiration for put-together and very stylish looks for a 50-something. 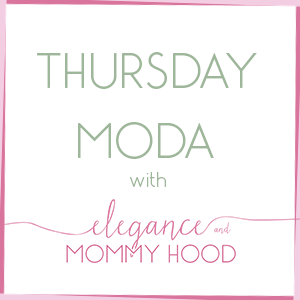 This week's Fabulous "Thursday Moda" Co-Host: Countdown to Friday. Below is a snippet of late outfits Kristin has worn that I loved. I need her collection of black footwear and gray sweaters because both are fab! "Hi! I'm Kristin and Countdown to Friday is my space to talk about my two passions: fashion and travel. I've always loved shopping on a budget and trying to make the most of my closet with flexible work and weekend pieces. I believe that you can look great and feel confident without breaking the bank. And as an American currently living in Germany, I also share my travel adventures. If you have a passion for fashion and travel, please follow me on Instagram, Bloglovin, Pinterest! I've been blogging for about 6 months and I love connecting with others who enjoy style and have a taste for wanderlust."